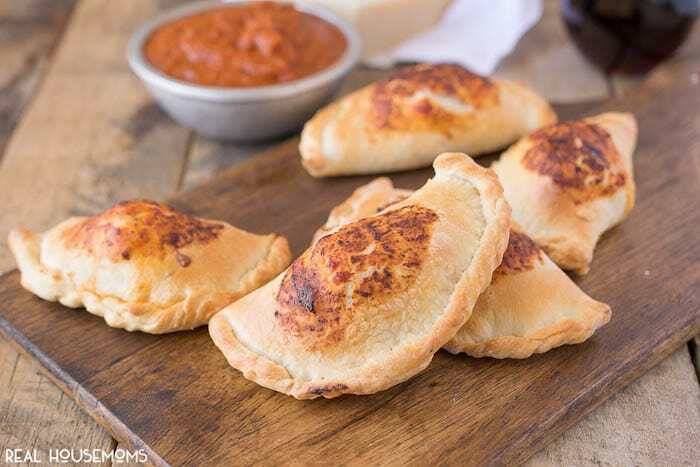 MINI HAM & CHEESE CALZONES are an easy to make dinner give pizza night a whole new meaning for kids and adults! 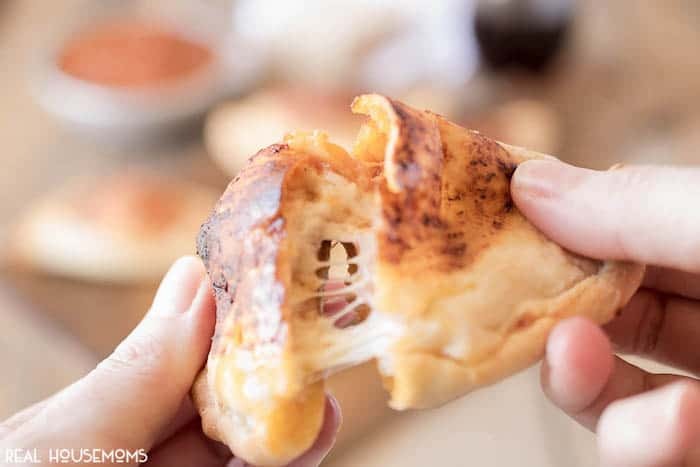 Calzone is Italian for ‘stocking’ or ‘trousers’. It’s like a pizza, wrapped in dough and the fillings can range from plain cheese, to sausage and served with a side of marinara sauce. Just like pizza, you can customize the calzone to fill them with any filling of your choice and a great change to regular pizza. For these particular calzones, I chose simple ham and cheese. If you’ve never made your own pizza dough, I urge you to give it a try. It is so rewarding and delicious and is easier than you think. I always have my own homemade marinara sauce in the freezer for times like this (you can also use your favorite jarred sauce). 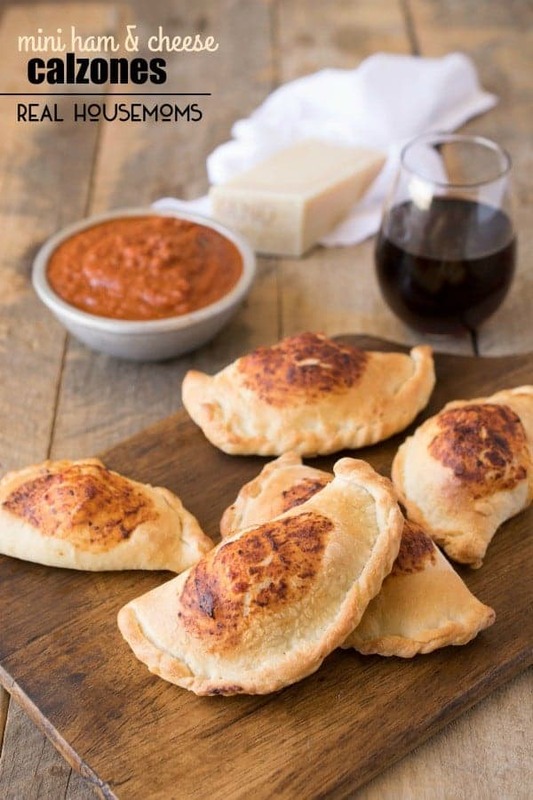 These calzones make perfect entertaining bites or something to nibble on while watching a movie, don’t forget extra sauce for dipping. To a clean work surface pile the flour and make a well in the center. Add a little of the yeast liquid and use your fingers to slowly incorporate flour. Add a little more liquid as it is absorbed by the flour until you get a nice dough ball. You may not use all the liquid, don't let the dough be too sticky. Lightly oil a bowl with a little olive oil and transfer the dough to the bowl. Turn once to coat all sides with the oil. Cover the bowl and put the bowl in a warm area to rise until doubled in volume, about 40 minutes. Punch down the dough and place it in a lightly-floured surface. Divide the dough into 12 balls. Cover and allow to rest for 20 minutes. Preheat oven to 325 degrees F and cover a large baking sheet with parchment paper. Once the dough balls have rested, working on a floured surface, roll out 1 ball to a 4 1/2 inch round, about 1/8 inch thick. Place half a teaspoon of sauce in the center and add 1 teaspoon cheese and a slice of ham, leaving a border. Fold the dough in half over the filling and press to seal using your fingers or a fork. Place on the parchment lined baking sheet and continue with the rest. Before baking, brush the pastry with milk and brush sauce onto the centers. Bake for 15 minutes until golden brown.